Tumbled travertine tiles are a stunning addition to a home. The light texture in them creates a soft, muted finish that works beautifully in larger areas, and the texture also makes them a safer choice for areas that will be wet. They are easy to install and care for, and they can be used throughout the home. Here are a few ways you can use travertine to delight your customers. People often choose high polish tiles for the bathroom, but these aren’t the safest choice. Tumbled tiles have a slight texture to them that provides you with a little more grip. You are not as likely to slip on them, so they are a fantastic choice for shower floors and even the main floor in the bathroom. When you choose tumbles travertine, you won’t have to put a non-slip rug on the floor. This makes the bathroom look larger and more sophisticated. Used on the shower floor, you won’t have to worry about family members slipping in the shower, and you won’t have to mar the beautiful appearance with special grips or shower mats.If you love a rustic or historic look, then consider adding travertine to the shower walls. The slightly rough texture and natural variations in the stones add interest to the shower and make it stand out. Add a border of tile with a glossy finish to make the travertine stand out more and create a little more visual interest in the room.You can also choose soap shelves, shower seats and other accessories made from beautiful travertine. They look amazing in the shower, and the light texture ensures that items remain in place even when the shelves become a little wet. When working on a bathroom renovation, encourage your customers to consider travertine tiles for their visual appeal, durability and safety. 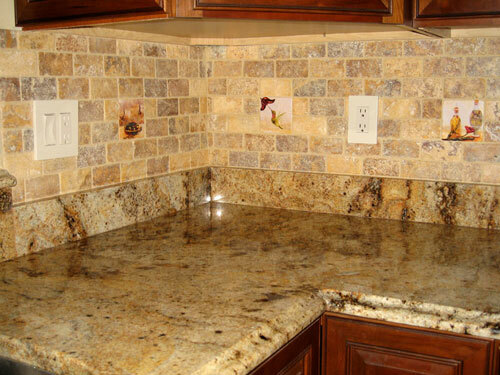 If you have people in the home with limited mobility, tumbled travertine is an excellent choice. Wheelchairs easily roll over it, but the texture prevents it from becoming slippery when wet. In addition to using this tile in the bathroom, you may also want to add it to the kitchen and the foyer. These areas also become wet, and the tumbled travertine will make them safer for people with wheelchairs or walkers. Keep this information in mind when working on design jobs or renovations for group homes, mother-in-law apartments and assisted living facilities. Rough concrete is the industry standard for pool decks, but you want something more attractive around your home. Your pool is a major investment, and you want it to look incredible. Tumbled travertine is a sophisticated choice. The travertine tiles will not be harmed by the water, and it will stay cool under your feet even when the temperature warms up. Water drains away easily from the tiles, and the texturing prevents them from becoming slippery. A luxurious choice for the patio, it makes your outdoor pool look like it belongs indoors. These tiles are an excellent choice for individual homeowners, spas, resorts and hotels. Ceramic tiles usually have a glossy finish, but tumbled travertine has a soft, muted look that you are sure to love. The colors show through without taking attention away from your stunning cabinets or other fixtures. A beautiful choice that’s easy to clean and care for, it adds style to this space without being overwhelming. If you have a client who loves to cook and wants a kitchen worthy of the finest restaurants, strongly recommend the addition of a travertine backsplash. Tiles are a great choice for covering any fireplace because they are durable and easy to clean. If you want the ease of tiles without the glossy finish or a high polish look, then consider tumbled travertine. The natural color will blend nicely with any neutral décor, yet the stones add enough interest to the fireplace to still make a statement. Installed on the fireplace facing and hearth, they are a durable choice that works beautifully on the fireplace for a sophisticated yet slightly rugged look. Mudrooms are usually a hazardous area as water is tracked in and mud falls off shoes. It’s vital to choose a floor covering that will be easy to clean, but you also want one that is safe for your children to walk on when it’s a little wet. With tumbled travertine, you will have everything you are searched for. The beautiful color adds style to this area, and the texture prevents people from slipping. At the same time, the tiles are easy to clean. With a mop and a little water, you can polish the floor and remove all traces of mud and grime to keep the entryway or mudroom clean. It’s an excellent choice for private homes, schools, retail stores and other establishments that see a great deal of foot traffic. If your outdoor living space incorporates grassy areas that you need to walk through, then add some tumbled travertine pavers. They provide you with secure footing when you walk through the yard, and your guests will be encouraged to stay off the grass. The tiles look incredible surrounded by soft, green grass. They add an elegant touch to the yard, and they help ensure that your guests are safe by providing people with a stable, level walking surface. Business owners will appreciate how this reduces their liability by making customers safer. Tumbled travertine is also an excellent choice for windowsills and door thresholds. Able to withstand the moisture that doors and windows are subjected to, they are an elegant addition to any room. Stone windowsills are easy to clean, and they are a marvelous departure from traditional wood that must be repainted and is prone to rot. They are a great choice for homebuilders and contractors alike. Wood decks are the standard, and concrete patios are a smart choice if you don’t want the maintenance of wood. However, travertine and other natural stones are the best choice. Tumbled travertine is safe to use outside, and you can cover your entire patio with these sophisticated natural stones. They add color and style to the area, along with a smooth surface that is safe to walk on when wet. Perhaps the best feature is that they require very little maintenance beyond being sealed every year to avoid staining. You can sweep them off, rinse them with the garden hose and your patio is ready for entertaining friends. This makes them an ideal choice for sidewalk cafes and other outdoor dining areas where the tiles will have to be cleaned regularly. Stonexchange carries beautiful tumbled travertine tiles that you can use throughout your home. The materials are all of the highest quality, and they are one of the top choices for interior designers and contractors. It’s easy to convince your customers that travertine is the right choice for their renovation, and having the tiles on hand to start the job can give you an edge when you are putting in the bids. Your customers will appreciate that they won’t have to wait for you to order tiles, so you can get started on the project faster. As a contractor, you know how important it is to save money on your purchases. Lowering overhead and controlling expenses makes it easy to boost your profit levels and make your business more stable. At Stonexchange, you will enjoy the low prices you expect from your suppliers. The stone tiles, sills and thresholds are all manufactured to exact specifications, and you can customize orders to meet your specific needs if you meet the minimum order requirements. Choose a supplier that offers timely shipments in secure containers. Whether you have a huge order or are buying just two crates, we will send everything through reliable, respected ground shipping companies. We offer crates and large containers, and we can deliver them directly to your main offices or the job site. If you decide to have custom tiles ordered, then it will take two to three months to deliver your products. However, in-stock items are usually shipped out the same day. Stonexchange specializes in windowsills and door thresholds, but we offer many other items as well. We carry tiles, pavers, slabs, mosaics, pool copings, saddles, soap shelves, shower caddies, shower curbs and shower seats, as well. Whether you are a retailer selling to the DIY crowd or a contractor trying to please his customers, we have the tiles you need. Contact Us today to order the tumbled travertine tiles you need for any large project. Order additional crates to have your supply on hand and ensure that you can start on projects in a timely manner. Your customers will appreciate the service, and you will our low prices and superior quality. Dark shades of brown to light shades of brown compose tile.